If you're familiar with my recent work you may have noticed a certain fondness for dragonflies. I've been trying out a variety of approaches in terms of how best to capture the feeling of these intriguing little insects. I've posted a series of images of my dragonfly incarnations here, if you'd care to see their evolution. I was initially captivated by the wings, as I'm sure most people are, but the more I study them the more I've come to appreciate the whole structure. They really are amazingly sculptural, to my eyes at least. This is my latest tsuba. It was completed earlier this year as my entry in the Nihonto Bunka Shinko Kyokai competition for newly made swords, polishing and associated arts. All entries that are deemed of sufficient quality to be accepted into the competition receive the designation of nyusen. This tsuba of mine was apparently well received, being admitted as nyusen and in addition it earned me an award called Gijustsu Shorei Sho 技術奨励作. It translates as "Technique Encouragement Award". Apparently this is roughly equivalent to the designation Doryokusho in the NBTHK shinsaku competitions. The basic plate is of a brass type alloy I made up based on analysis' of various old examples. It's called shinchu in Japanese. 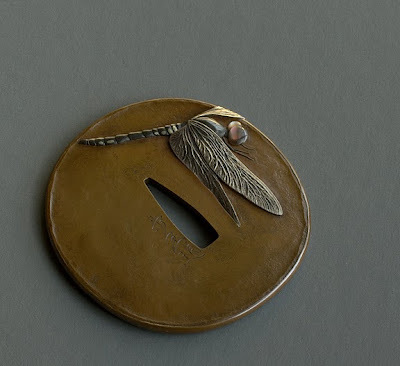 The dragonfly is of shibuichi, ao-kin (green gold), shakudo, silver and the eyes in mother of pearl. If you like to see some more images of this tsuba you will find some here, in my picasa gallery. These are a pair of gold menuki I've just completed. They were made in a 22ct gold alloy comprising gold and silver. This particular alloy is called ao-kin in Japanese, green gold. The technique I used to create them is called uchi-dashi and is a process of slowly moving and manipulating a thin sheet of metal into a full, 3 dimensional sculpture. The metal is held in warm pitch and formed by means of small punches driven by a hammer. 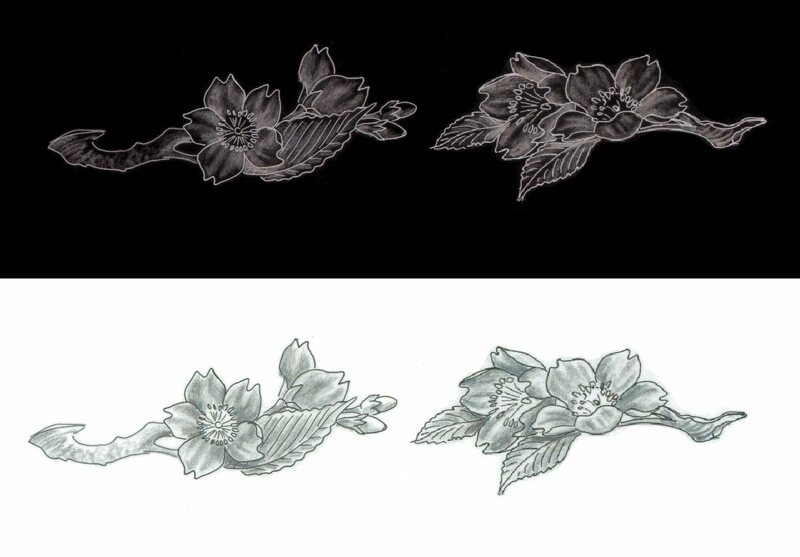 You can see a sequence of images detailing the making as well as some more images of the finished menuki by following this link. This was the original design I came up with...the final gold versions are pretty similar I feel.